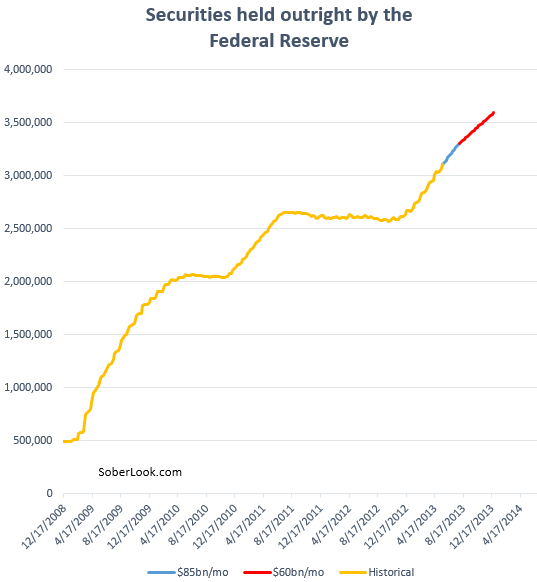 Sober Look: What would the Fed's policy "step down" look like? What would the Fed's policy "step down" look like? A number of economists are trying to read into the meaning of Bernanke's statement last week. The comment that put a damper on the relentless equities rally and sent prices of treasuries lower. In particular the comment "we could take a step down in our pace of purchases" at the next FOMC meeting is causing angst in the investor community (see post). But what would such "tapering" in monetary expansion look like? The most likely outcome is a shift from $85 billion of purchases a month to something closer to $60 billion. Here is the impact such a policy would have on the central bank's portfolio of securities. The Fed is unlikely to do anything more dramatic, given the central bank has bet its reputation on this program. Reducing monetary expansion sharply just to return to it later will clearly be problematic. The outright holdings will therefore comfortably go above $3.5 trillion by the end of the year in spite of this policy pace "step down".